Metal Slug Advance (AKA メタルスラッグアドバンス in Japan) is a 2D side-scrolling run and gun action video game that consists of the main character advancing through five game levels by freeing hostages and killing enemies using different weapons. The game was developed and released by SNK Playmore for the GBA (Game Boy Advance) in 2004. It is remarkable as the only Metal Slug video game not to feature Marco Rossi as a playable character. Anyway, this game is so EPIC! 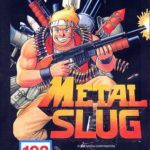 ​As with the other versions of Metal Slug on different platforms, the handheld version retains the trademark goofy appearances and animations of its characters. The classic sound effects which old Metal Slug players has come to know is also preserved. ​As for the visuals, Metal Slug Advance is made up of multilayered 2D backgrounds. Each level has different terrains including mountain, desert, or jungle. And as improvement, developers also incorporated different effects such as lightning strikes, which are typically not seen in handheld games. ​With regards to the gameplay, Metal Slug is a true action game for the fact that it mostly consists of just shooting and slicing your way through enemy territories. There are no usual gimmicks like items to purchase or puzzles to solve. This happens in ALL run and gun games! However, this game for the GBA has optional feature that allows players to collect cards by freeing prisoners or defeating enemies. Of the 100 different cards varieties, most are just indications of various game milestones, but some give extra buff like permanent ammunition or health increase. To add challenge, cards that are collected in a certain level could actually drop when the main character loses a life. So to hold on to these collected cards, one just has to go through the level unscathed. Again, collecting cards is just optional. ​The game only has five main quests, making it seem somewhat short—though it helps that no levels even remotely resemble a run-through of a previous level. Also, each mission is packed with tough enemies with an even tougher level boss. The array of weapons and vehicles, as well as the presence of alternate pathways also add challenge and fun to the game. All in all, what makes players so hooked on this game is the option to replay finished levels just for the sake of blowing things up, encountering different equipment and vehicles, and seeing the many different character animations. Metal Slug Advance game has only been ported to the Game Boy Advance. But, remember, you can play it online on MyEmulator. Just go to the top of the page!